The upcoming animated TV show Star Wars Resistance is yet another Star Wars project coming into a world already beset with a new trilogy of films, two Clone Wars-era serials, two "A Star Wars Story" movies, a short-lived LEGO-branded TV series, and the Galactic Civil War-era Rebels show. So how is this new spin-off going to stand apart? How about giving audiences one of the best looks at how the Star Wars universe (or is it "galaxy"?) shifted and reorganized after the events of Return of the Jedi? In the latest issue of our sister publication SFX magazine, executive producers Justin Ridge, Brandon Auman, and Athena Portillo reveal how they plan to cover one of the freshest eras in Star Wars history. "The eras of the original trilogy, Rebels and Clone Wars, are so well thought out and there are already lots of [canonical] novels and comic books filling in the gaps," says Auman, pointing out that other shows have even had to scrap stories because there were just too many overlapping projects being put out. "Dave [Filoni] told me that one of the plot points he intended Rebels to touch on was stealing the Death Star plans, but obviously they couldn’t do that because Rogue One was coming up, so you’re in kind of a tighter alcove. Now we’re in this wide-open space that we can mess around in." And if you're curious about how organizations like the Resistance came about, this will be a window into its beginnings and evolution. Even the nefarious First Order will get some screen time. "This is really our chance to get more insight into them," says Ridge. "We’ll find out more about Phasma and her team, the people who operate under her, and what they’re trying to achieve." 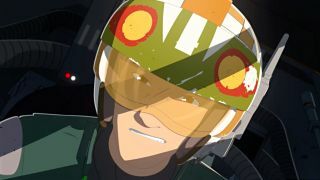 You can catch the first episode of Star Wars Resistance on October 7 via The Disney Channel. Want to read more about Star Wars Resistance and all the biggest sci-fi and fantasy entertainment news? You can order SFX online and have it delivered to your door. Or, subscribe and be ahead of the game so that you never miss an issue. Take advantage of our cut-price digital and print bundles and take SFX wherever you go.